Next year will be a pretty big year for DC, as Batman v Superman marks their first tentative foray into a new cinematic universe. That means merchandise out the wazoo—and not just movie stuff. 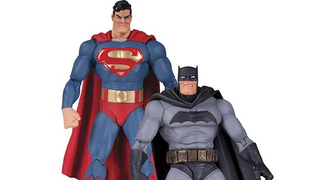 DC collectibles would like to remind you where the movie all started, with two figures from The Dark Knight Returns. I can’t tell if Bats and Supes are trying to both be super serious about justice or whatever, or if they both just really, really need to poop. Although the figures themselves aren’t new, they’ve been given a few updated paint apps to ostensibly celebrate the 30th anniversary of The Dark Knight Returns’ publication taking place next year. But let’s be honest, it’s also a less than subtle reminder that the Man of Steel and the Dark Knight will be duking it out off the pages and on the big screen next year too, isn’t it? I’m not gonna complain though, they’re neat looking toys! The 30th Anniversary two pack will set you back $40 when it releases in February of next year.